Volare (Nel Blu Dipinto di Blu) (Domenico Modugno, Eurovision, 1958). The world of Absolute Beginners is also the high tide of Italy’s cultural influence on British youth. The cliche of dolce far niente Italian life had allured Britons since the Renaissance, and now it helped that the Italians had been the inept junior partners of the Axis, so there were no hard feelings about air raids, for instance. What Italian culture offered the postwar British was a readymade sense of style—hence the late Fifties vogue for coffee bars, Vespa and Lambretta scooters, tailor-made suits, Fellini films. Adopting Italian styles led directly to the Mods, as it offered the most appealing distance from the throwback “American” stylings of the great Mod rivals, the rockers. Contemporary Italian pop music was part of the package. Domenico Modugno’s “Volare” (its official title was “Nel Blu Dipinto di Blu”), Italy’s entrant to the 1958 Eurovision competition, placed third at Eurovision but as compensation it became a worldwide hit, even reaching #1 in the US in the summer of 1958, with various covers, most notably Dean Martin’s, charting near-simultaneously. Bowie’s cover (in Absolute Beginners, it’s heard only on the radio while his character, the ad man Vendice Partners, is driving around the lead, Colin) is impeccably sung, with Bowie handling the Italian lyric so well that perhaps he should’ve made an Italian version of “Heroes” rather than a French one. Bowie, like most interpreters, excised Modugno’s original weird opening, where he recalled a dream in which he painted his flesh blue and then soared off into the sky. The production is clean and sparkling, the bongo/marimba rhythms add a Brazilian flavor, the period guitar solo is executed perfectly. It’s prop-music. Recorded June 1985 at Abbey Road Studios, London. Included only on the double-LP version and the CD issue of the Absolute Beginners soundtrack. 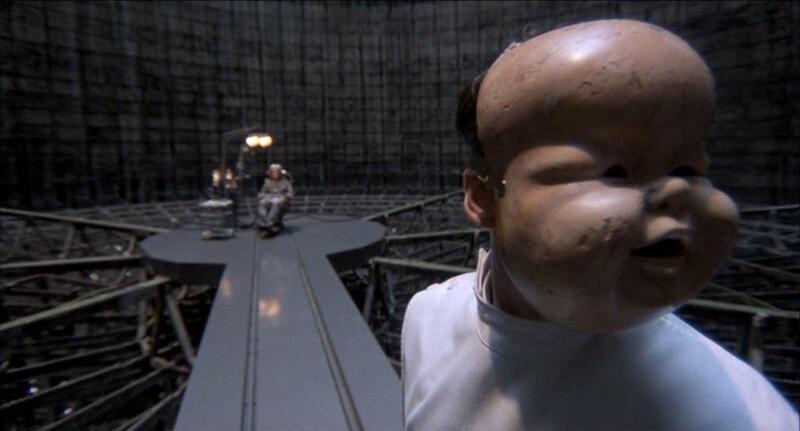 Top: Terry Gilliam, Brazil, 1985. This entry was posted on Monday, January 9th, 2012 at 8:11 am and is filed under EMI Years: 1983-1990. You can follow any responses to this entry through the RSS 2.0 feed. Both comments and pings are currently closed. Hey, Brazil is one of my favourite films. You are right, Bowie does sing this track really well. absolutely!..i’m reminded of this every time i stop by at bar italia in soho….on sundays in summer the mods still turn up there on their scooters in reverence…it’s the sweetest thing. I’ve always thought it sounded like it was recorded with a casio keyboard … maybe my download went wonky, but even in the 80’s I thought they’d forgotten to add a bass. I’m Surprised ScumFrog or David Guetta didn’t add one and turn it into a sickening hard house floor filler. and … oh yes … who voted in the Digital Spy survey? One staffer by the look of the results. ‘Magic Dance’ in the Top 10 all time songs? Whaaaaaa? Bowie certainly should have made an Italian version of ‘Heroes’ rather than a *German* one. Not his finest moment. ‘Volare’ makes quite effective background music though. I can’t help but wonder what compelled you to place such an ominous picture above an article concerning such an innocent song. Now this is one that I haven’t heard before! One of these days, I’m going to get the CD of the Absolute Beginners soundtrack. Wow! That’s a lot of work! I’ll take a closer look after work today. Not heard this before – well not knowingly anyway – saw the film when it came out in a flea pit in Lewisham but I digress – it is rather good isn’t it? Works well in the movie if ya can hear it. I think heroes works well in german , the french is awful. Hi–actually he doesn’t omit that first stanza about painting himself blue and flying into the infinite! That’s where DB’s Italian version starts.